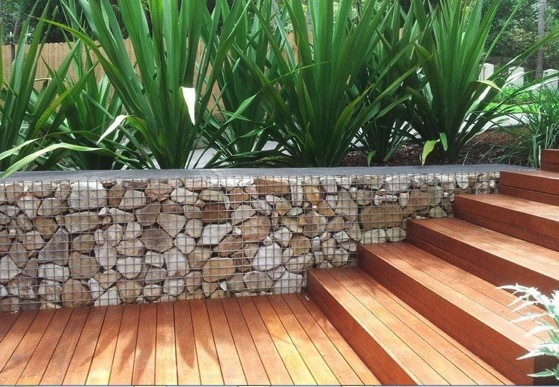 Gabion walls are an interesting style that can be adapted in many different ways. They are basically wire baskets filled with whatever stone you wish. They can be basic and functional or quite decorative, as well as large, small and everything in-between. 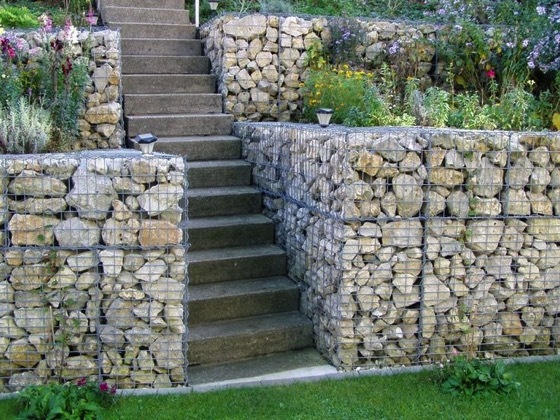 A gabion (from Italian gabbione meaning “big cage”; from Italian gabbia and Latin cavea meaning “cage”) is a cage, cylinder, or box filled with rocks, concrete, or sometimes sand and soil for use in civil engineering, road building, military applications and landscaping. Leonardo da Vinci designed a type of gabion called a Corbeille Leonard (“Leonard[o] basket”) for the foundations of the San Marco Castle in Milan. Categorized under: Build/Make, Design, DIY, Education, Garden Decor, How-to, Landscape, Pinterest, Projects.